John Deere are famous for their ride on mowers, but not all people can afford, nor do really need, a ride on lawn mower. That’s where classic push models come in. Luckily, John Deere has a great selection of those type of mowers as well. The first from that family on our list is the R40 Push Mower. This excellent machine will cost you just under 350 pounds, which is a little expensive for push model, but still very acceptable. Of course, such a price would be ridiculous if the mower did not have features that would warrant such a price, and, surely enough, it does have them. We start with the engine. The R40 features, like all other John Deere mowers, a Briggs and Stratton engine. In the case of R40, it’s a B&S 4 horsepower, 2.9kW engine – a pretty good little engine that will ensure that the grass gets cut properly, no matter the conditions. Sure, the mower may not be able to cut the heaviest, sturdiest grass, but it’s more than a match for a standard suburban lawn. The engine is a recoil start and starts promptly, and with only one to two pulls of the cord. As for the deck, we’ve polypropylene, 40cm (16’’) deck. It is pretty sturdy and robust, able to withstand a long life of service, but also light enough. This is a push mower, after all, and it mustn’t be overly heavy so as not to fatigue the one pushing it. The handlebar also helps, as it is adjustable, and will make sure that the machine caters to both tall and short people alike. The 16-inch deck makes the mower more oriented toward smaller yards, as middle-sized yard mowers’ decks start from 18 inches and upward. You also have central cutting height adjustment. When clippings are concerned, this machine allows you to bag them or discharge them. The mower cannot mulch, so it’s a 2-in-1, but it can be modified, and you have the option of purchasing and installing a mulching kit. If this is a worthwhile investment or not, you will decide, as the mulching kit costs another 80 pounds. All in all, the R40 Push Mower is a great little machine, intended for smaller yards. 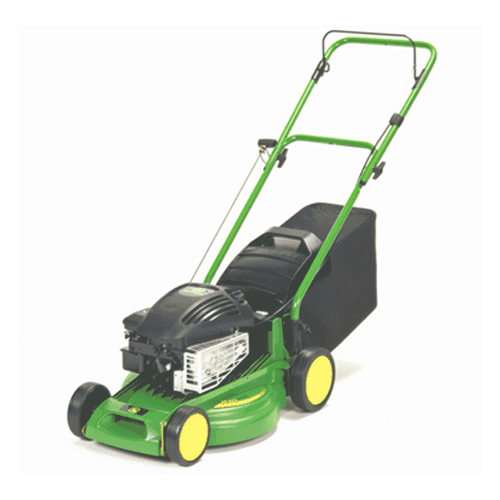 It has a good and reliable engine and starts quickly and without any fuss, it’s powerful enough to cut grass in almost all conditions and has a robust deck that can stand the test of time and frequent use. The only downside is that it can’t mulch right out of the box, but this is a minor offense that can be easily mitigated.